People are more willing to experiment with where they eat and with the popularity of shows like Come Dine With Me and underground restaurants covered on shows like Jamie's American Road Trip, it feels perfectly acceptable to go around a strangers house and pay for the privilege of them cooking you dinner. Maybe the attraction is the Russian roulette nature, in that you don't know whether you are going to get the good, the bad or the downright ugly (food, host and location included). It's an exciting, new and growing scene and an experience no restaurant can match. London has a host of established and successful underground restaurants but the scene is starting to bubble in Brighton. And with the often eccentric nature of Brighton and its inhabitants, I personally couldn't think of a better place. I don't know what I was expecting of my first underground experience, but it was entirely exceeded. Walking into the personal space of another human, expecting to be served is odd no? Well no. 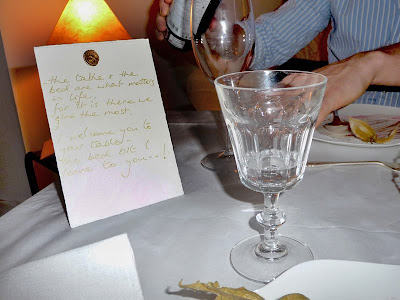 It could have been the beautiful apartment located in one of the Regency Brighton properties off the seafront, but I think it was the warm welcome of the hostess that made me feel quickly at ease. I mean you don't get a peck on the cheek from a restaurant owner as a welcome would you? Also, in a restaurant you would NEVER talk to the people around you, yet this intimate space was like an open forum. Super. It was intimate and actually quite romantic, but if there are interesting people to engage with then it always makes for a pleasant evening. I like the little details and I appreciated the personal touches like the wax seal and handwritten quotations on the back of the menus. So what about the food? The menu for the evening (£25 donation per person) was entitled Winter Warmer and by heck we needed warming up. 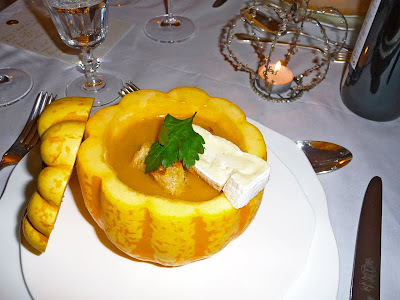 We started with a Roasted Pumpkin Soup with Parmesan Croutons served in a hollowed out pumpkin. Creamy, gorgeous and homely. Exactly the sort of soup I could happily live on. 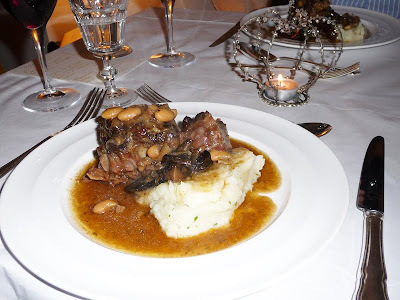 Main was Oxtail Slow Braised in Guinesss with Cannellini Beans and Mash. Mr Graphic Foodie loved this so much that his pleading eyes won him a second helping (another bonus versus a traditional restaurant). There really isn't too much to dislike about this dish. Deep, rich, comforting and fulfilling. Not the prettiest of dishes but looks aren't everything in real eating. 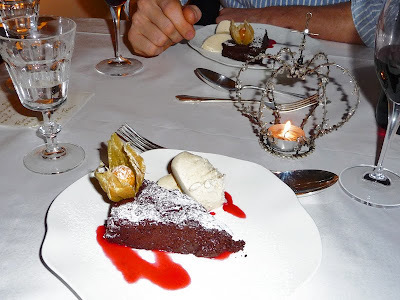 We finished with Flourless Chocolate Cake with Raspberry Coulis and Ice Cream. Flourless cakes remind me of occasions I have been subjected to dining with certain veggie friends who seemingly have allergies to everything that tastes good. But this was lovely and gooey, whipped off the plate in little time. Coffee and tea was served in darling vintage cups which I have a hopeless passion for. Love Poppy also does a vintage afternoon tea that will be well worth a look. As this was the opening night I was impressed. I have cooked for 10-12 people on many an occasion but to cook for paying guests is another matter entirely and takes a brave individual. I probably would crack under pressure but Poppy was as cool as a cucumber, peeking out from behind the screened kitchen for chats. If you are interested in trying an underground restaurant you will obviously not find information via the regular sources. Exact addresses are divulged after you have booked and drinks are typically BYO. Prices vary but are generally in the £20 - 30 mark. To book a table at Love Poppy's underground restaurant in Brighton visit Love Poppy's Ning page or blog. To find an underground restaurant near you visit the Supper Club Fan Group on Ning or search via Facebook or Twitter.